South of Sloat Boulevard, built by the Gellert Brothers in the 1940s and 1950s. 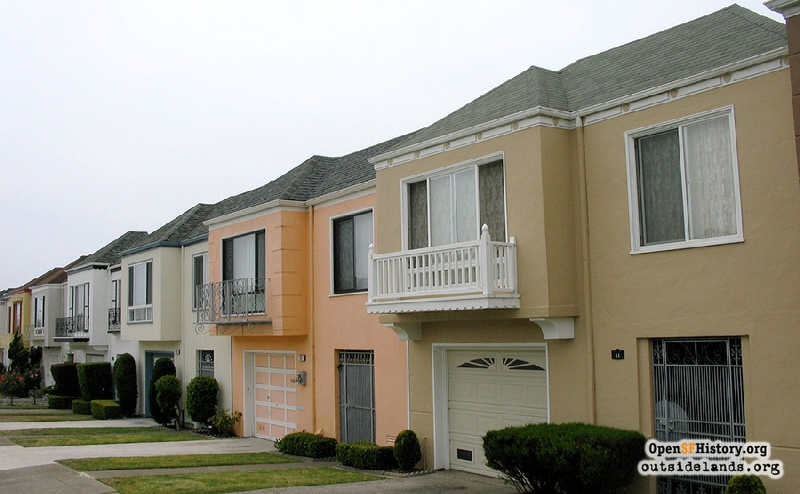 Location: Lakeshore Park lies between Sloat and Lake Merced boulevards, Inverness Drive, and Sunset Boulevard. 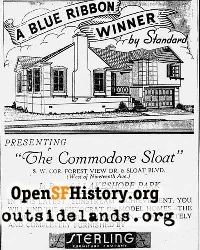 In 1932, the Standard Building Company built its first full subdivision on Ardenwood Way off Sloat Boulevard, with twenty-four Tudor Revival residences. "Ardenwood," built in the depths of the Depression, sold slowly and the brothers went back to a business model that featured efficiency and speed over architectural detailing and variety. Standard Building Company joined other merchant builders such as Henry Doelger, Chris McKeon, and Ray Galli in aggressively developing the Sunset District with affordable row houses built in assembly-line fashion. 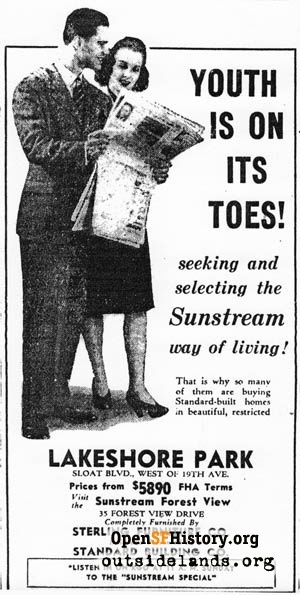 In 1939, Standard Building Company created the "Sunstream Homes" brand name as a designation specifically for single-family row houses in the Sunset District priced less than $6,000. The company copyrighted the name, and within a year had increased sales by 45%.3 The Sunstream brand grew beyond this original low-price use, and was employed by the company into the 1970s. In 1939 and 1940, the Standard Building Company built over 240 houses in the Pine Lake Park subdivision. Originally platted and lightly developed by the Parkside Realty Company in the late 1920s, Pine Lake Park curled around the southern edge of Stern Grove north of Sloat Boulevard. In 1939, the Gellerts purchased the farmland south of the boulevard from the Spring Valley Water Company for a new subdivision. Confident from rising sales and an improving economy, Standard Building Company moved away from its practice of marketing new homes to low-income buyers and advertised that "Lakeshore Park" would be a "de luxe subdivision"5 with restrictive covenants usually found in high-end residential parks. Taking aim at higher-income buyers, the Gellerts initially planned to build fully detached homes in Lakeshore Park. The first buildings, on the east side of Inverness Drive south of Sloat Boulevard, followed this pattern, but the desire to maximize the land value apparently won out, and the blocks built before World War II followed the Sunstream row house model.7 With FHA terms, a Lakeshore Park home could be bought for as low as $5,890,8 just a little more than a typical Sunset house. Rather than continuing the numbered avenues of the Sunset grid, as the Fernando Nelson company had done with the Merced Manor subdivision to the east, Standard Building platted Lakeshore Park with nature-inspired street names: Sylvan, Middlefield, Forest View, Riverton, Springfield. 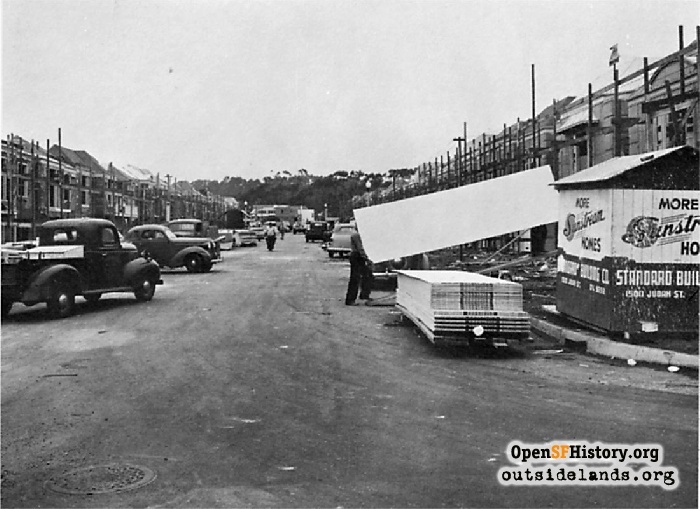 The work crews moved east to west, constructing one block of houses at a time with an open model home each block or two as the crews progressed. Sterling Furniture furnished the first Lakeshore model home, named the "Sunstream Lakeshore," at 20 Forest View Drive. In reference to the competition of subdivisions being advertised down the peninsula, the Sunstream Lakeshore was advertised as a "city home with a suburban background." 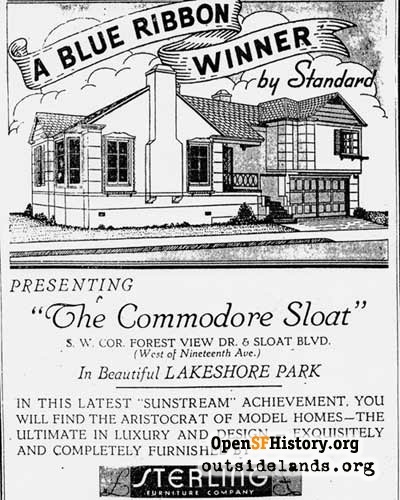 Subsequent model homes were opened at 35 Forest View Drive (the "Sunstream Forest View," February 1941); 141 Forest View Drive (the "Sunstream Six," May 1941); 101 Forest View Drive (the "Sunstream Sterling," May 1941); 1201 Sloat Boulevard (the "Commodore Sloat," August 1941); 20 Meadowbrook Drive (the "Leader," November 1941); 117 Meadowbrook Drive ("Anniversary House," commemorating one year of Lakeshore Park, December 1941); and 76 Middlefield Drive ("Sunstream Security," a name perhaps inspired by the country's entry into World War II, with ad slogans such as "Defend your future," February 1942). In August 1941, Standard was building on Meadowbrook Drive.11 By February 1942, the company had reached the west side of Middlefield, and down select blocks to Eucalyptus: over 200 houses constructed in five months, or more than a house a day. The United States' entry into World War II halted the Standard Building Company's prolific work, as materials and labor were redirected away from residential developments and into defense work. The company issued a "last call" for home buyers in March 1942. Advertisements and work on Lakeshore Park stopped soon after. During the war, the company built military housing and facilities across California. In 1947 Standard returned to residential construction and Lakeshore Park homes began to reflect post-war architectural trends with detached split-levels, ranch-styles, and double garages. The price of a new home more than doubled after the war, with returning servicemen able to buy homes with little or no money down. Sunstream homes, which sold for less than $6,000 in 1939, went for $12,000 ten years later.12 In the early 1950s Lakeshore Park was completely built-out, and Standard Building Company created a small shopping center, Lakeshore Plaza, on the west side of the development. In 1948, the United States Supreme Court banned the use of race in deed restrictions and covenants.13 Despite the law, the Standard Building Company faced repeated accusations that they would not sell or even show houses to African-Americans. Standard Building Company sales people repeatedly vacated an "open house" when they saw potential African-American buyers approaching. Brown and friends responded by entering the empty house and waiting for the agents to return over a number of days. With pressure from the mayor and civic groups, Standard eventually promised to stop discriminatory practices. The Standard Building Company continued constructing Sunstream Homes throughout the Bay Area into the 1970s, but the energies of the Gellert brothers moved into the creation and operation of charitable foundations until their deaths in 1974 and 1978. Sales brochure for Sunstream homes. 1. Sunstream Homes, 50 Golden Years of Home Building Excellence, Standard Building Company, 1972. 2. San Francisco Chronicle, January 5, 1941, 9. 3. "San Francisco Home Builder Makes Free House Calls," National Real Estate Journal, June 1940. 5. "Tract Nears Sell-Out; New Area Opens Soon," San Francisco Chronicle, September 29, 1940, 15. 6. "Declaration of Restrictions, Conditions and Covenants affecting real property situated in the City and County of San Francisco, State of California," filed August 1, 1941, San Francisco Recorder's Office, Liber 3782, 392. 7. By building wall-to-wall in the style of row houses, Standard could add four houses more to a block side. 8. Standard advertisement, San Francisco Chronicle, February 16, 1941, 10. 9. 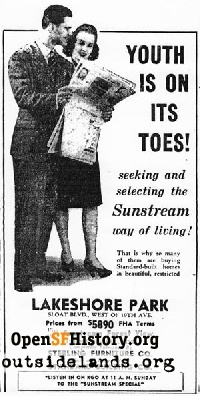 "Standard's Home Closes," San Francisco Chronicle, January 26, 1941, 13. 10. "New Standard Building Co. Model Home Opens Today," San Francisco Chronicle, February 2, 1941, 10. 11. San Francisco Chronicle, August 10. 1941, 11. 12. American Builder, June 1949, 110. 13. Shelley v. Kraemer, 334 U.S. 1 (1948). 14. Willie Brown, Basic Brown: My Life and Our Times (New York: Simon & Schuster, 2008), 84. 15. "S.F. Homes Picketing to Spread," San Francisco Examiner, June 3, 1961, 1. 16. "FEPC Blast At Builder—Race Bias," San Francisco Chronicle, May 7, 1966, 1. 17. "Rights Boycott of Tract Asked," San Francisco Chronicle, May 13, 1966, 28, and Stephanie Salter, "Home-building brothers changed the map of San Francisco," San Francisco Examiner, March 11, 1985, B1. Page launched 7 October 2009.